View our archive of past news releases. Media inquiries can be made by calling (757) 475-8839. NORFOLK, Va. – The neuroscience unit at CHKD has been accredited as an esteemed Level 3 epilepsy center by the National Association of Epilepsy Centers, making it one of four pediatric facilities in the state to be certified. The NAEC accredits Level 3 centers for providing a comprehensive team approach to the diagnosis and treatment of epilepsy, including medical, neurological, and psychological aspects. These centers bring together neurologists, neurosurgeons, nurse specialists, EEG technologists, pharmacists, social workers, and others to provide an integrated system of care. The organization defines four levels of centers, and grants certifications to the two highest, Levels 3 and 4. In Virginia, eight hospitals are certified, with CHKD the only free-standing children’s hospital to achieve that designation. At CHKD, four video EEG rooms with state-of-the-art diagnostic equipment enable neurologists and epileptologists – neurologists who specialize in epilepsy – to confirm the presence of seizures and to monitor them over time. The most common treatment is medication, based on the type of seizure, age of the child, side effects, cost, and east of use. The center also offers surgical options. There’s also a treatment called “vagus nerve stimulator,” in which a pacemaker-like device is implanted to stimulate the vagus nerve, which runs from the brain to the torso. The device sends small pulses of energy to the brain to stop seizures. It works without patients even being aware of it most of the time, but if they sense a seizure coming on, they can swipe a magnet over the left chest area to send an extra burst of stimulation. The unit also has a dietitian who oversees a ketogenic diet program, which is a special type of diet that reduces seizures in some children for whom medication doesn’t work. In the two years since the neuroscience unit opened, close to 900 patients with seizures have been treated. For more information on epilepsy and treatments at CHKD, visit this website: CHKD Epilepsy Program. 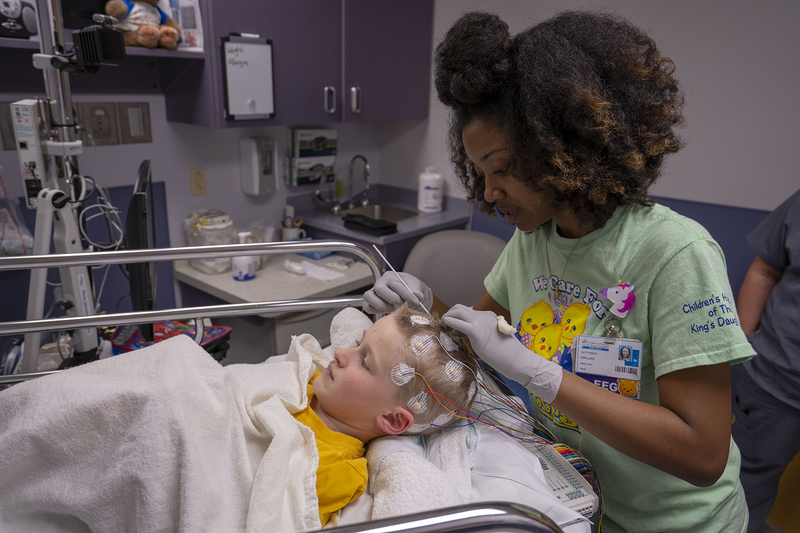 A 6-year-old patient is evaluated at CHKD's neuroscience unit, which was just accredited as a Level 3 epilepsy center by the American Association of Epilepsy Centers. The designation means the unit provides comprehensive, integrated services for the diagnosis and treatment of epilepsy. CHKD is the only freestanding children’s hospital in Virginia and serves the medical and surgical needs of children throughout greater Hampton Roads, the Eastern Shore of Virginia, and northeastern North Carolina. The not-for-profit CHKD Health System operates primary care pediatric practices, surgical practices, multi-service health centers, urgent care centers, and satellite offices throughout its service region. NORFOLK, Va. – Children’s Hospital of The King’s Daughters has received a $10,000 grant from Huggies “No Baby Unhugged” program to support its volunteer cuddler program. The grant was one of eight given to hospitals throughout the country this year to start or support ongoing programs that increase human touch of newborns in neonatal intensive care units. At CHKD, the grant will be used to buy recliner chairs and footstools and to pay for expenses such as volunteer immunizations, uniforms, and background checks. CHKD opened its NICU in 1972. Today, it’s the most advanced in the region, admitting about 550 babies a year. The volunteer cuddler program began in 2003 with nine cuddlers, a number that’s since grown to 39. Last year, they logged 1,600 hours of hugs. Cuddlers must first have 60 hours of volunteering in other parts of the hospital before taking on this important position. For more information about volunteering at CHKD, visit www.chkd.org/volunteer. Dale Pearson, CHKD’s longest running volunteer cuddler, has been comforting NICU babies for the past 15 years. She’s a polio survivor who spent time in the hospital as a child growing up in Maine, and remembers seeing others in “iron lung machines” in wards far different from the cheerful units at CHKD. The Portsmouth resident comes to CHKD every week to bring comfort and cheer to hospitalized children. Pictured: Long-time CHKD volunteer cuddler Dale Pearson prompts a smile from a NICU patient. CHKD is the only freestanding children’s hospital in Virginia and serves the medical and surgical needs of children throughout greater Hampton Roads, the Eastern Shore of Virginia, and northeastern North Carolina. The not-for-profit CHKD Health System operates primary care pediatric practices, surgical practices, multi-service health centers, urgent care centers and satellite offices throughout its service region. Huggies believes in the Power of Hugs. No Baby Unhugged is Huggies’ promise to ensure babies get the care they need to thrive – from innovative everyday products, growing hospital hugger programs, and developing specially designed products for the tiniest of babies. For more information on the No Baby Unhugged program, visit the “Why Huggies?” page at Huggies.com. CHESAPEAKE, Va. – CHKD Medical Group is pleased to announce the addition of Pediatric Partners of Hampton Roads to the CHKD family. The practice offers more than two decades of experience from board-certified pediatricians Dr. Vernita Peeples and Dr. Danielle Lecky-Chaudhuri. Dr. Peeples and Dr. Lecky-Chaudhuri received their medical degrees from Eastern Virginia Medical School, and completed their pediatric residencies at CHKD. Pediatric Partners of Hampton Roads, which was founded in 2002, will continue to provide services at 656 Independence Parkway, Suite 200, in Chesapeake, as a practice of CHKD Medical Group. The practice offers high-quality comprehensive pediatric care backed by the expertise and specialty services of CHKD. For more information or to schedule an appointment, please call (757) 410-3630. CHKD Medical Group is an organization of 20 pediatric practices in 31 locations. The group is part of Children’s Health System, Inc., which operates Children’s Hospital of The King’s Daughters in Norfolk, the state’s only full-service, free-standing pediatric hospital. NORFOLK, Va. – Children’s Hospital of The King’s Daughters has received the American College of Surgeons’ highest level of certification for pediatric hospital surgical programs, one of just 15 centers nationwide to have earned this designation. Dr. Robert Kelly, chief of surgery at CHKD, today announced the hospital’s surgical program, which includes the main hospital in Norfolk and surgery centers at Concert Drive in Virginia Beach and Oyster Point in Newport News, has been verified as a prestigious Level I center. The centers must meet rigorous criteria for staffing, training, facility features, and protocols for care in a program that aims to raise the level of children’s surgical care across the country. The initiative began certifying centers in 2015 that could show continuous efforts to improve surgical quality, prevent complications, reduce costs, and save lives. The verification requires a site visit by a panel that includes an experienced pediatric surgeon, anesthesiologist, and nurse, which reviews the program for a multidisciplinary approach and a unique focus on each patient. The center must also participate in a national data registry to track and compare its processes and outcomes and devise ways to improve them. The Level I centers must offer multiple medical and surgical specialties with procedures for major congenital anomalies and complex diseases. NORFOLK, Va. – Children’s Hospital of The King’s Daughters is pleased to welcome the following new pediatric specialists to its professional staff. Dr. Thomas Gallagher has joined the department of ear, nose, and throat surgery at Eastern Virginia Medical School. Dr. Gallagher earned his medical degree from Philadelphia College of Osteopathic Medicine. He completed his residency training at Naval Medical Center Portsmouth. He also did a fellowship at Massachusetts Eye & Ear Infirmary. Dr. Gallagher is an associate professor in the Department of Otolaryngology at EVMS. He is board certified by the American Board of Otolaryngology and belongs to the American Society of Pediatric Otolaryngology and the American Academy of Pediatrics. He also is an associate editor of the journal for the American Academy of Otolaryngology, Head & Neck Surgery. Dr. Daniel Spencer has joined the psychology division of Children’s Specialty Group. Dr. Spencer earned his medical degree from the Keck School of Medicine at the University of Southern California. He then went to Brown University to complete his triple board residency at Rhode Island Hospital. Dr. Spencer is board certified by the American Board of Pediatrics and the American Board of Psychiatry Neurology in both psychiatry and child and adolescent psychiatry. Dr. Spencer served four years as co-director of psychiatry of the integrated care medical psychiatric program at Hasbro Children’s Hospital in Providence, R.I. He has a clinical interest in family-based integrative care. Dr. Bettina Gyr has joined the orthopedics and sports medicine department. Dr. Gyr received her medical degree from the University of Texas Medical Branch. She did her residency at the School of Medicine at the University of Virginia, and completed a fellowship at the University of Utah. She is board certified by the American Board of Orthopaedic Surgery. Dr. Gyr came to CHKD after nine years at Brenner Children’s Hospital of Wake Forest Baptist Health. While there, she was on the staff at Wake Forest University School of Medicine and served as medical director of the human performance and biomechanics laboratory and as an associate professor of orthopedic surgery and pediatrics. Prior to that, Dr. Gyr was a staff surgeon at Shriner’s Hospital for Children in Minneapolis.